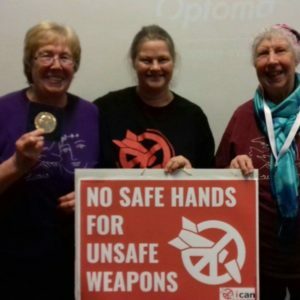 The ‘Libyan Model’ is Unhelpful: Korea needs its Own Process for Peace and Nuclear Disarmament, writes UK WILPF member Rebecca Johnson. You can read the original article here. SEOUL (IDN) – I’m now in Seoul, taking part in the peace actions and international meetings organised by Women Cross the DMZ, referring to the demilitarized zone between North and South Korea. News has been dominated by fears that the US National Security Advisor, John Bolton, may have jeopardised the hoped-for Singapore Summit between North Korean leader Kim Jong-un and US President Donald Trump. Was this Bolton’s intention? As South Korea’s President Moon Jae-in meets with Trump in Washington, it is hoped that all efforts will be made to consolidate plans for the Singapore Summit to be successful. Bolton’s references to the “Libyan model” for North Korea’s disarmament were extremely unhelpful. Whether intentional or not, his remarks predictably evoked the humiliating and brutal demise of Libya’s despotic leader Muammar Gaddafi during Libya’s “Arab Spring” uprising in 2011. This spooked Kim Jong-un, who has reportedly been haunted by fears of a similar fate after he took over North Korea’s dynastic leadership that same year. Trump tried to offer reassurance on Kim’s safety, while other US leaders appeared to suggest that this fate could befall him if he did not fulfil US demands for denuclearization. It is also relevant that Kim cancelled lower level meetings that had been scheduled for more detailed Inter-Korean discussions launched by Moon and Kim when they met at PanMunJom on 27April. It is understood that he was angry about the resumption of provocative military exercises in the region and testimony from a high level defector and former North Korean diplomat, Thae Yong-ho, in Seoul’s National Assembly. Bolton’s reference to “the Libyan model from 2003, 2004” was either mistaken or meant to signal a threat. Mistaken, because Libya did not have any nuclear weapons in 2003-04 – or ever. Gaddafi undoubtedly toyed with nuclear yearnings over the years, but Libya never developed a significant nuclear programme, much less weapons. The deal, backed by UK Prime Minister Tony Blair and US President George W. Bush, played a positive role in eliminating Gaddafi’s chemical and biological weapons programmes, with inspectors verifying and monitoring this process. There was also a non-proliferation aspect, as the deal rested on Gaddafi’s collaboration in a sting operation to entrap Pakistan’s bomb-maker-in-chief A.Q.Khan, resulting in the substantial dismantlement of Khan’s notorious black market in nuclear weapon technologies, including designs and components. Khan’s clients reportedly included North Korea, Iran, Saudi Arabia, and several Middle East governments. Without underestimating the importance of these objectives, the Libyan model was not about nuclear disarmament. The deal was struck because it served the personal and political interests of Gaddafi, Bush and Blair, as Britain and American became bogged down in the Iraq War. It enabled Gaddafi to achieve his long-standing desire to come in from the cold, 15 years after Libya was condemned for the bomb that murdered Pan-Am passengers over Lockerbie. It gave Bush and Blair a much-needed PR boost at a time when they were coming under heavy criticism as the Iraq War dragged on with a mounting death count and – as UN Inspector Hans Blix had warned – no WMD to be found. They basked in the accolades for denuclearising Libya, as presented by the US-UK spin machines. Gaddafi’s role bought him high profile hugs and economic aid. He also received considerable military and intelligence assistance from the US and UK, including the rendition of members of Libya’s civil society opposition who had sought asylum abroad, among them Abdul-Hakim Belhadj and his pregnant wife Fatima Boudchar, who recently received the British government’s formal apologies for their role in 2004, resulting in Belhaj suffering six years of torture and imprisonment. Whatever Bolton meant when he evoked the Libyan model, there are dangers and consequences when presidents or officials make off the cuff remarks or press the wrong buttons. It is worrying to see how many media commentators just dutifully repeated the false narrative that the US-UK deal with Gaddafi resulted in North Korea’s denuclearisation. Some then drew from this erroneous example the baseless lesson that nuclear disarmament led to Gaddafi’s brutal demise several years later. From this they dramatically jump to arguments that Kim’s survival depends on keeping whatever nuclear capabilities he has, so the Korean peace and disarmament talks are doomed to fail. Peace, disarmament and security are far too precious to be thrown away because of mistaken assumptions, smoke and shadows. They have to be based on facts, evidence and analysis, as well as effective diplomacy. This in turn requires understanding the participants’ psychologies, fears and concerns, as well as their personal and national interests and objectives. After so many years, disarmament cannot be achieved in one summit, but the summits and the Inter-Korean meetings are necessary steps to create the peace processes and practical disarmament relationships and steps. The leaders will negotiate disarmament when people on all sides imagine security and peace are achievable without such weapons, and work together to make it happen. That’s how the International Campaign to Abolish Nuclear Weapons (ICAN) mobilised to bring about UN negotiations and achieve the 2017 Treaty on the Prohibition of Nuclear Weapons (TPNW). Disarmament is best achieved through cooperative diplomacy. Recent experience indicates that North Korea will not denuclearise through coercion. The 2017 Nuclear Prohibition Treaty provides an important new legal and diplomatic instrument that can greatly contribute to achieving and sustaining the nuclear disarmament objectives all sides in Korea say they want to accomplish. Korea doesn’t need false analogies with Libya. The Korean people and the leaders from the North and South need to be inspired and supported to create their own model for a peaceful, nuclear free Korean Peninsula.